Five years after the Great Recession officially ended, more than one in 10 Californians now rely on the federal Supplemental Nutrition Assistance Program (SNAP) — called CalFresh in California — for food assistance. This rate has risen slowly but steadily since 2011. CalFresh benefits are available to most households with low incomes, generally defined as at or below 130 percent of the federal poverty line (about $24,000 for a family of three). Caseloads thus closely track trends in poverty rates. However, California is tied with Wyoming for the lowest SNAP participation rate among all states. In addition, undocumented immigrants are ineligible, as are seniors and people with disabilities who receive a Supplemental Security Income/State Supplementary Payment (SSI/SSP). Taken together, this means that the share of Californians in poverty has been higher than the share receiving food assistance. As we blogged about this year, poverty rates vary widely by county. The same is true of the share of the population using CalFresh in each county, as the map below shows. The highest rates of CalFresh use are in the counties with the highest poverty rates, such as San Bernardino (18 percent enrolled in the program), Imperial (20 percent), and many Central Valley counties (most with rates higher than one in seven). In Tulare County, one in four residents are receiving CalFresh. In San Mateo and Marin, around 4 percent do. Even as job growth picks up, some counties are faring worse than the state overall. High rates of food assistance in many places show a clear need for policies and programs that reduce poverty. One of the most important points isn’t captured in the map: Nearly half of those eligible for CalFresh — estimated at 3.2 million people — are not receiving it. Recent efforts to expand access and streamline enrollment should bring help to those who need it. These efforts include ending time-consuming and stigmatizing fingerprinting requirements, and reaching out to newly enrolled Medi-Cal recipients who are likely eligible for food assistance. Some counties have begun to employ targeted outreach programs to increase participation among underserved populations, especially seniors, non-English-speaking households, and people who are homeless. Comparing county performance over time may yield key lessons on what works to improve access for different segments of the population. 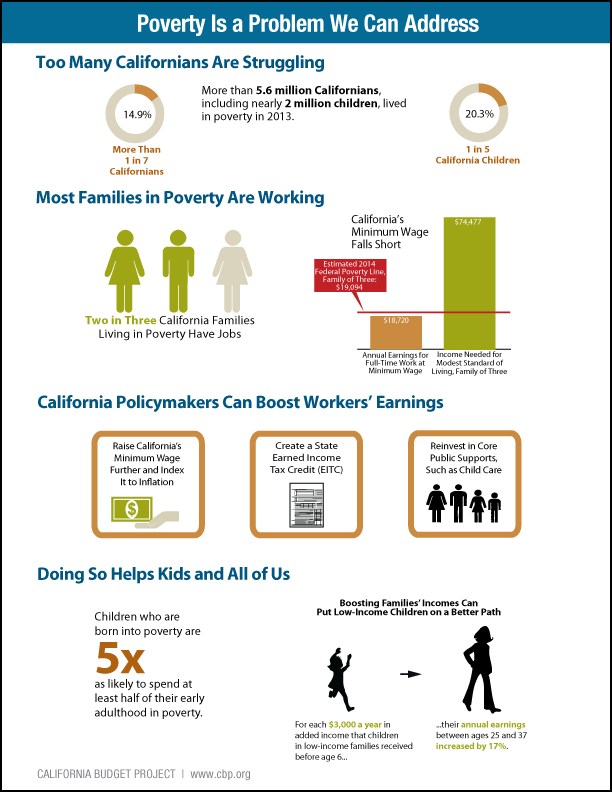 Stay tuned for more analysis of CalFresh data by county, including a special focus on children.